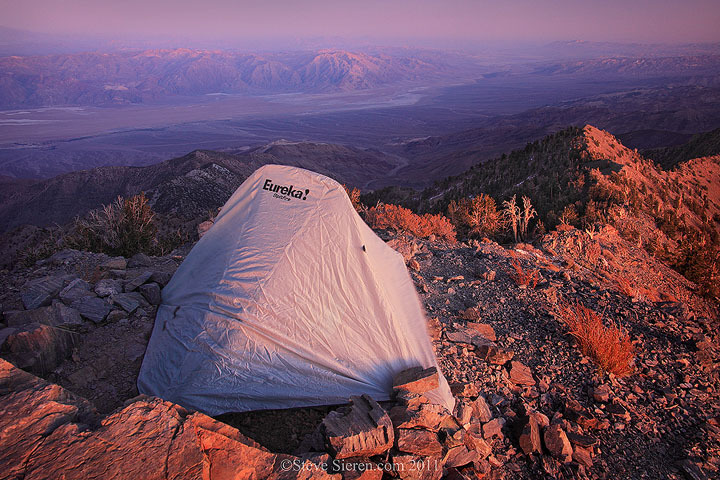 Backpacking on Telescope Peak amongst the bristlecone pines, in Death Valley’s highest point at 11,049 ft brings up memories the foothills of the White Mountains and slightly the peaks where the bristlecone pines flourish. 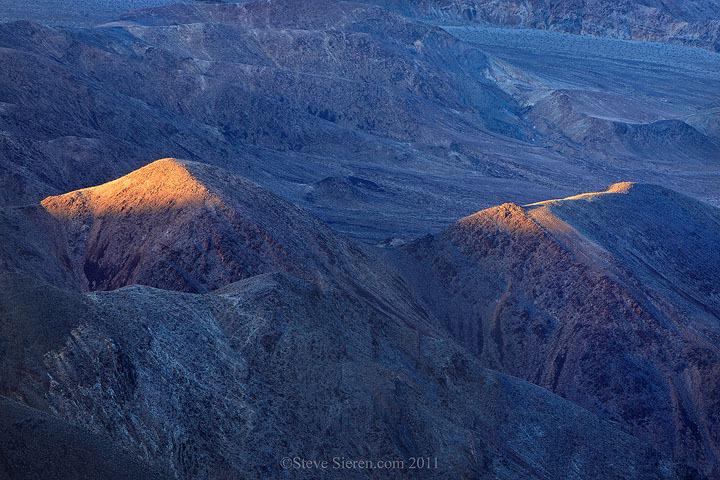 Some of the best views in Death Valley can be found on Telescope Peak. We’ve done this backpacking trip before but I just happened to let Christina pick the trip from a list of backpacking trips that we have already done in Death Valley. We came back down with a little bit of water left over from the 2 gallons we each brought up. It was windier then it looked and we were weighted down pretty good. I built a good rock barrier around the tent to keep the wind out of the tent. Although we’ve been up here many times, the view of the Sierra always seems to get better every time! We could make out Lone Pine Peak’s side profile along with Mc Addie, Whitney and Russel. 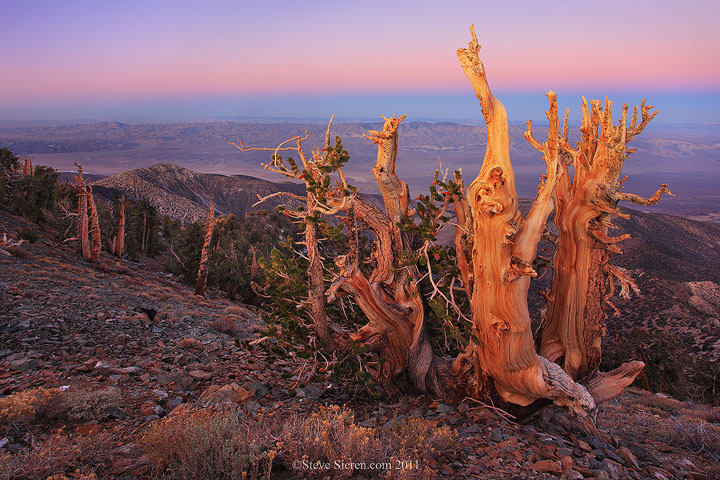 These weathered bristlecone pines on the slopes of Telescope Peak can make one wonder how long they’ve been there. The Panamint Valley, Argus Mountains and Sierra Nevada Range lie in the background of the photograph above. I mentioned I let Christina pick the trip this time, but I was hoping we would of ended up in a canyon where it was a lot warmer. She got a new down jacket, figures she had to test it out somewhere. Anyway the view sure beats having to look through google earth. Even though I’ve been there before I still tend to look at Google Earth before every trip I go on. It’s just so much different in person. With a 360 degree turn there are views, views, views, I’m telling you!! Here are a couple of fresh perspectives with light and shadow on a couple of buttes along the foothills of the Panamint Mountains in. I always like to keep an eye out for pyramid shaped peaks out there, I seem to enjoy composing images around them. I always plan to write and share much so much more from every trip but I never get the time do it so I hope you all enjoy this curt summary of the experience. Maybe I’ll come back to it again with more to share. 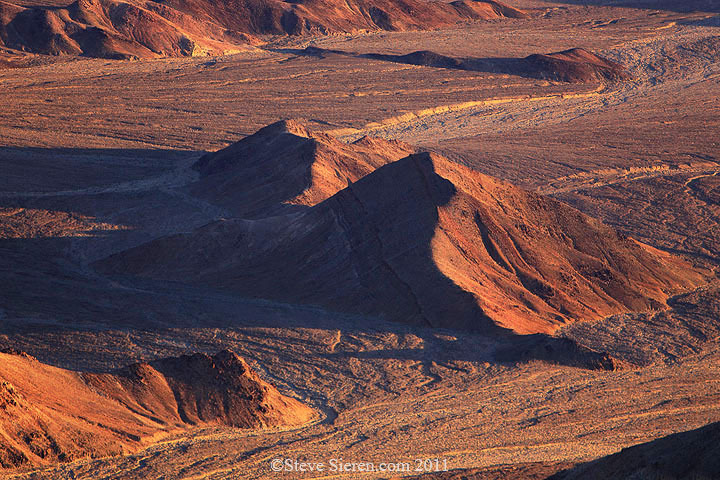 *For those interested in workshops: Only 1 spot left in the Death Valley workshop this coming March, 2012. Only announced it last week and it’s practically sold out – The Death Valley Experience Guess a few happy students from previous workshops just can’t get enough! This entry was posted on November 1, 2011 at 8:51 am and is filed under Uncategorized. You can follow any responses to this entry through the RSS 2.0 feed. You can leave a response, or trackback from your own site. I love it! I still can’t believe that Christina backpacks overnight, and now even in the cold:) Her jacket must have been a lifesaver! Glad you both had fun. Views and views and – – – breathtaking and breathtaking and – – – It’s hard to find words for what you show here. I wish I could experience this once – and not “only” watch your great pictures! Steve, this is a superb set of images and great commentary! I’ve only hiked Telescope Peak once but would love to get back and focus on photography. Marissa, glad to hear from you! Christina has been getting pretty active lately. We should all hike sometime close to home! Thanks for commenting, I sure wish I could explain what it felt like up there but 3 photos is just not doing it justice. There will be more shared a later date..
Mizzy, the 3 to 4 hour separation really hurts the amount of visitation time doesn’t it! Greg, I do love hiking with out the camera, it helps me decide whether a place is worth returning to with the camera!